What a little trust can accomplish. Trust establishes a number of preconditions before any project can hope to succeed on the fast-track. It also helps to ask a few questions to assure trust is present before launching a project on the fast track. Does every member of the project team have experience with this type of project? Does the team have sufficient decision making authority? Can project leadership perform under pressure? Are project support systems such as IT, purchasing, contracting, legal clearance, materials and other influential project services positioned to support a fast-track project? Is risk low, or at least well-managed? Will resource availability become an issue? Is the project's financial support assured? The San Francisco-Oakland Bay Bridge provides a case study in trust. The bridge closed when the 1989 Loma Prieta earthquake collapsed its roadway. The California Department of Transportation (CalTrans) manages the largest highway transportation system in the world and it knows bureaucracy, yet it was able to dispense with the rule book and repair the span in 30 days. CalTrans had done it before in 1971 when the Saugus quake struck just north of Los Angeles, in 1994 when the Northridge quake took down the Santa Monica freeway, a vital link to downtown Los Angeles, and again in 2007 when a tanker fire collapsed an overpass that closed two freeways in Oakland at one of the most heavily traveled freeway intersections in the world. Then, traffic flowed in 24 days without the rule book and because trust was never an issue. Performance on these projects earned well-deserved bonuses for the contractors who protected CalTrans' trust by performing. There is a saying that between time, cost and quality we are only allowed to pick two. Rush orders, overtime and recovery from unanticipated problems come at a premium, and are also norms on the fast track. 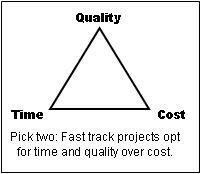 Most enter into fast-track projects accepting the tradeoff between the high cost of buying time while maintaining quality. Private enterprises typically accept this tradeoff for profit reasoning that the faster results are produced, the more profit there is to be gained. Some paybacks are not as clear as profit and loss, but they are still present. The State of California has the world's sixth-largest economy and it thrives on its highway system. Fallen freeways cost the State's economy far more than the cost of fast-track repairs, which is why California is willing to add bonuses to the cost of an emergency freeway fast-track project. Planning and compressing time out of project schedules. It helps to start a fast-track project with a normal-track schedule, one that shows how much time the project would normally require. Then the schedule becomes one big puzzle where the objective is to determine how to apply funding, resources and technology to squeeze time out of the schedule much like squeezing water out of a sponge. One of the most effective methods for shortening project development time is to turn tasks that would normally be scheduled one after the other (serially) into parallel tasks. Product developers, for example, typically have projects with a development phase and a test phase. The first of these two schedules shows the development phase starting in April and ending in August, and the testing phase beginning at the end of August and ending in November. After all, how can something that hasn't been developed be tested? The answer is that development needs to be underway, but not completely finished in order to start testing. In the example at the right, the planner realizes that a major portion of the development will be done by July. Testing can begin on components that are ready in July and continue on the entire product through the end of August, September and into early October. Note that development and testing still require the same amount of time each, but the taken together, this schedule has been shortened by five or six weeks by overlapping the two phases. Note how resource availability is critical when overlapping tasks. The second schedule assumes that there is a development team and a testing team. If a single was expected to perform the development and the testing, this schedule's timeline would have to be compressed some other way, perhaps by removing some features that might be highly prized, but are not compatible with the fast track. 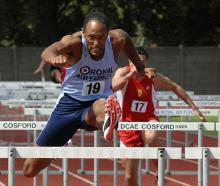 Using gateways to focus cross-functional teams. Gateways are parallel milestones with deliverables from organizationally separate participants in the project. Continuing the example from product development, the Engineering Group is responsible for design, Testing verifies the product's performance and functionality, Manufacturing provides the capacity to build it, Marketing will promote it, and Customer Service will support it. These contributions need to be developed in parallel and gateways provide a way to time deliverables so that different components of the project will come together at the same time. Gateways work as well for projects on the fast-track as projects that are not; it is just that they are more critical for multifaceted projects. The black diamond milestones seen at the right tell the Documentation, Capacity Planning, Marketing and Training groups that they must start specific contributions to the project on August 4th in order for everything to be ready for the November 3rd release date. Gateways are similar to the starting, halfway point and finish lines at a race that all runners need to end in a tie. Fast-track a project with a team planning session at a Project Kickoff Meeting. with Technical Pathway's Multiple Projects consulting services. 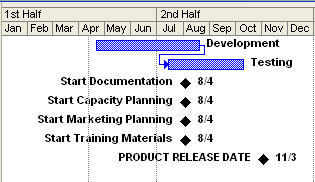 Learn more about fast-track schedule development in the Project Scheduling Workshop.